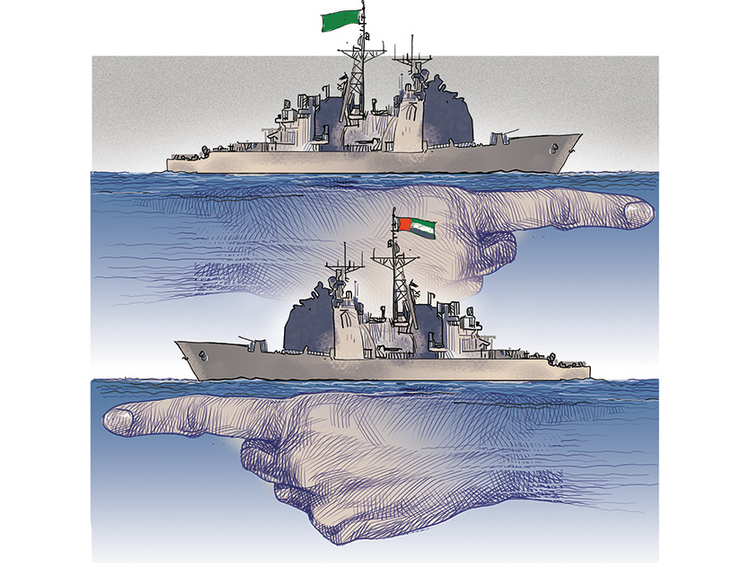 The UAE is establishing two naval bases in the Red Sea in Somaliland’s Berbera and Eritrea’s Assab at the same time that Saudi Arabia is boosting its naval presence in the south Red Sea with a naval base in Djibouti. A few years ago, such a forceful presence would have been to combat Somali pirates, but today the threat is from a burgeoning Iranian presence in north Yemen, where Iran is backing Al Houthi rebels against the Yemeni government backed by the Saudi-led coalition in which the UAE plays a vigorous part. On February 12, the parliament of the self-declared Republic of Somaliland agreed to allow the UAE to set up a military base in Berbera. The scale of what is planned is unclear, but the UAE is already constructing an air and naval base in Eritrea at the Red Sea port of Assab under a 2015 agreement, from which it has already mounted operations in the Yemen, 60km to the east across the Red Sea. Meanwhile, Saudi Arabia is finalising an agreement for a base in Djibouti with the government of the former French territory, with which Riyadh signed a security pact in 2016. Djibouti has the added advantage of being a member of the Arab League and of the 34-state Saudi-led anti-Iranian “Islamic coalition” announced in December 2015. Djibouti is a busy place since it is where the United States runs its main regional counterterrorism base at a former French Foreign Legion facility, and China is also building a base there with an eye on its westward expansion into Africa and its strategic interest in securing the Indian Ocean trade routes. BBC analyst Tomi Olipadio has pointed out that in Somaliland, the UAE has an alternative and less controversial location than its base in Eritrea, which is under United Nations sanctions. The BBC reports that the UAE will also provide much-needed training and equipment for Somaliland forces, as the unrecognised but de facto nation steadily expands its authority and ability to offer its people stable government. This is in stark contrast to the rest of the former Somalia, which has broken up into small statelets and a larger territory in the south around the capital that is controlled by the nominal government. The threat to that government posed by militant group Al Shabab has been largely kept out of the Northern Territory of Somaliland and having a stronger local force backed by an international partner will shore up this stability. But the port in Berbera is not solely, or even mainly, for military use. In September 2016, DP World announced that it will manage and develop the port at Berbera in a concession that will last for 30 years with a 10-year automatic extension. The company will own 65 per cent of a joint venture with the government of Somaliland to manage and invest in the port, which could be as much as $442 million (Dh1.62 billion) over time. Dubai-based DP World is one of the world’s leading port operators with more than 75 terminals worldwide, and the Berbera deal gives it a new hub in the Red Sea near its existing port in Djibouti. An extra focus on the Berbera port project from the Somaliland side is to offer the unrecognised nation a strong economic opportunity to increase through-trade in the Horn of Africa region, and in particular targeting its landlocked neighbour Ethiopia. This steady expansion of trade should bring prosperity and expanded stability to the struggling regions of the southern Red Sea. The threat of piracy from the southern Somali coast has receded in recent years, but the sea-borne activities of Al Houthi rebels in north Yemen has greatly worried international shippers who have now ordered their vessels to go down the Red Sea on the western side to benefit from the protection that Djibouti and Assab can offer, whereas until a few years ago, they followed the eastern coast to try and avoid Somali pirates. And there is a wider geopolitical threat that affects entire Middle East. Ed Blanche of Arab Weekly outlined the Iranian threat in the Red Sea, pointing out that in recent years, Iran has sought to establish alliances with Eritrea, Sudan and other Red Sea countries to enhance its capabilities against two of its key enemies, Israel and Saudi Arabia, which both have naval access to the Red Sea. The Yemen war has provided Tehran with a toehold in the Red Sea because Iran supports Al Houthi rebels in north Yemen whom Saudi Arabia and the UAE are fighting. Yemen could also offer potential naval bases to Iran from which it could threaten shipping through the Bab el Mandeb strait, the Red Sea’s southern gateway to the Indian Ocean, as it has long sought to do with the Strait of Hormuz, the only way in and out of the Arabian Gulf, said Blanche. The Horn of Africa is particularly important because it has a 4,000km coastline that runs from Sudan in the north to Kenya in the south and lies astride the Red Sea and South African cape maritime routes.